This is a great video on taming a feral kitten to be comfortable with people. This is part 1 of 4 parts. 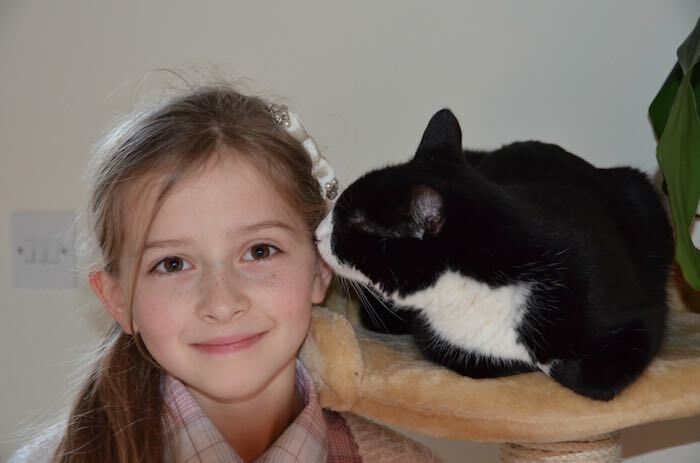 Pippa’s incredible gift came to light when she crept into Mia’s room and woke her up in the middle of the night prompting the schoolgirl to test her blood sugar levels which showed they were dangerously low. And when Pippa couldn’t get into the schoolgirl’s room to check she was feline fine, the persistent puss woke up her mum, Laura instead. Mia has type one diabetes, an incurable condition, which she manages by regularly testing her blood sugar levels and injecting herself with insulin. She was diagnosed with the condition at the age of 6 when her parents were concerned that she was eating more than before but not putting on weight. Mia tests her blood sugar levels between four and six times a day. If her blood sugar levels drop dangerously low she can experience a hypoglycemic episode which could lead to a coma. As the article says dogs have been trained to detect and warn of dangerously low blood sugar, and many other things, but cats have not. Here are more instances of cats alerting people to dangerous blood sugar levels: Cat Glucose Monitor?, Rare Cat Tests Diabetic for Low Blood Sugar. I am a cat person, no surprise, but I do find service dogs to be awesome. It would be wonderful if we could get more service cats. Though even with my innate cat bias I must admit I am not so hopeful for a huge increase in the number of service cats. Some cats are used to make people more comfortable with emotional support which is nice but I think stretches the definition of “service animal” to a point at which it is meaningless. Yes, animals that make people more comfortable are wonderful but calling them service animals is pretty silly. You might as well call dropping a baby in someone’s lap a couple times a day is a service worker. But it isn’t. It would be helpful for many people and even extremely helpful, but that doesn’t make the act an act of service. Cats evolved to hunt for food. And given how many birds, chipmunks, bunnies, mice etc. outdoor cats catch (and sometimes bring back home) they haven’t lost those instincts. They also sometimes stalk us, thankfully that usually doesn’t result in any serious damage. It isn’t uncommon, however, for our cats to become too sedentary and put on an unhealthy amount of weight. One way to encourage some activity is with puzzle feeders. These also let you reduce food while also giving some extra food they can get with more effort. This webcast shows an example of a simple puzzle feeder you can make yourself. There are also many available for purchase including: Trixie Mad Scientist for Cats, Catit Design Senses Treat Maze and Egg Cersizer Interactive Toy and Food Dispenser. Cats like music. But, like people, they want music composed for them, not some other species. You may purchase music for your cats (from the company that made the samples included here). The cat ballad should be restful and pleasing for your kitty. Feline airs draws sympathetic emotions from the listener based on the sounds of cats purring. David Teie developed and outlined the first comprehensive theory that attempts to explain the cognitive processes involved in our appreciation of music. Working with Charles T. Snowdon at the University of Wisconsin, they studied the affect of David’s species-specific music on cotton-topped tamarin monkeys, resulting in the first controlled study that demonstrated significant and appropriate responses to music from any species other than human.